Previous articles have discussed the underlying principles, and implementation of a Standard Operating Environment. While most previous implementations have been accomplished using Red Hat Satellite and Puppet, Ansible is now seen as the simplest way of performing server configuration and orchestration. This article demonstrates how to get started with calling Ansible playbooks, hosted on Ansible Tower, from Red Hat Satellite’s deployment mechanism. 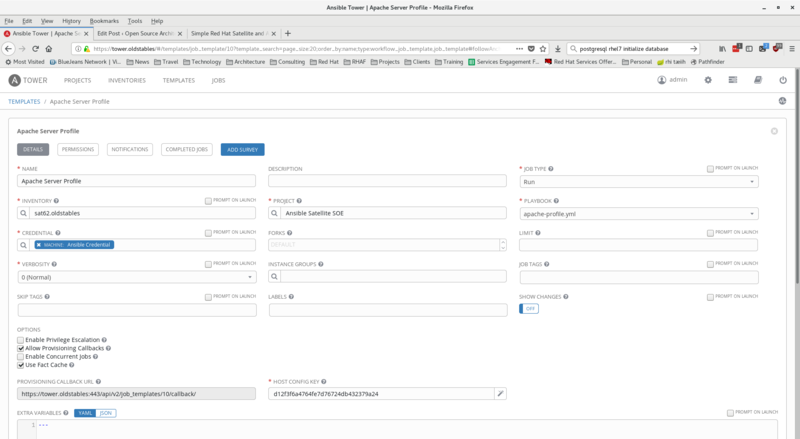 Within Red Hat Satellite, a profile maps one-to-one with a Hostgroup. 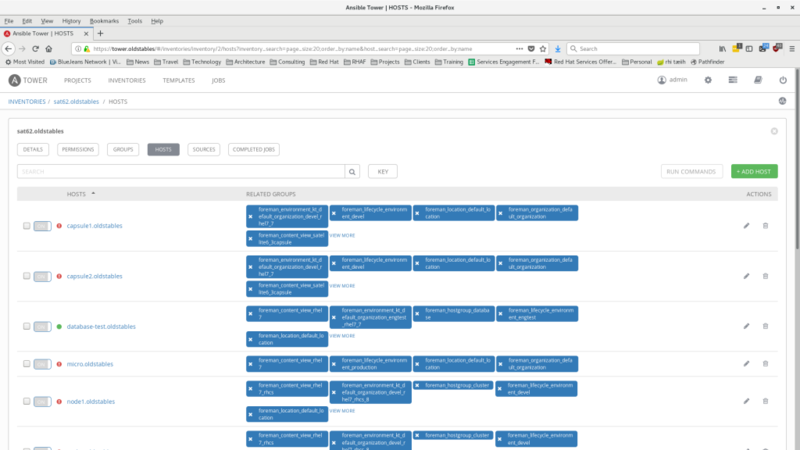 Within Ansible, a profile maps one-to-one with a playbook. Therefore, for each profile we need, we will create a single Hostgroup in Satellite, and a single Ansible playbook. Deploying a server from the Hostgroup will ensure that the correct Ansible playbook is executed in the kickstart to configure the server. Create a credential of type ‘Red Hat Satellite 6’ with satellite username and password. Add the credentials you previous created to the inventory. Tick the ‘Update on launch’ tickbox. Set a suitable cache timeout, for example 120 seconds. You can experiment by setting host parameters within Satellite and then refreshing the inventory – your newly created host parameter will show up under the ‘foreman_params’ dictionary in the host entry in the inventory in Tower. 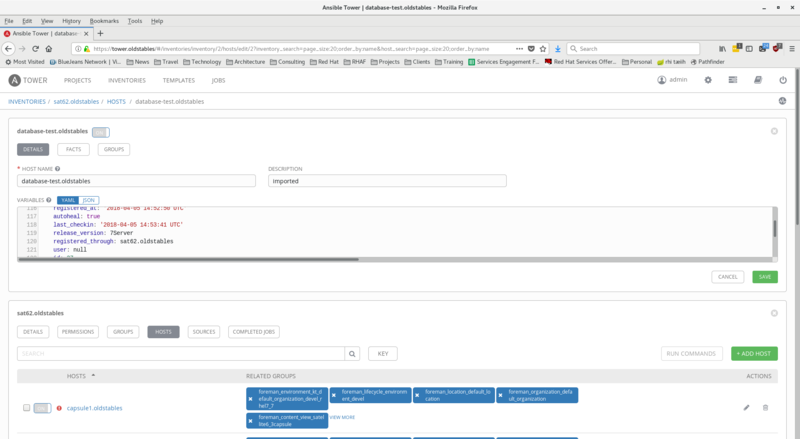 As you can see from the screencap above, provisioning callbacks are enabled for this job template – this is what will permit us to execute the playbook from within the deployment task in Red Hat Satellite. ansible_provisioning_callback This snippet checks the parameter ‘ansible_tower_provisioning’ and if it is True, creates a one-shot provisioning service that will execute post-installation. ansible_tower_callback_service This is the service enabled by the ansible_provisioning_callback snippet. The ansible_provisioning_callback snippet is included in the default kickstart template (Satellite Kickstart Default) however, no ssh key distribution method is provided so we will need to modify the default kickstart template to create an Ansible user and authorise a key for it. This snippet will create a user called ‘ansible’ and add the public key stored in the Satellite host parameter ansible_ssh_key to the users list of authorised keys. It will also add the ansible user to the sudoers list. ansible_ssh_key The public key of the machine credential you will be using in Ansible Tower to execute your playbooks. Create a Hostgroup in Satellite for each server profile you want to deploy. These hostgroups should be correctly configured to entitle the server and correctly register it to a Content View and Lifecycle Environment – information on how to do this can be found in the Satellite documentation available here. Ensure that the hostgroup will use the modified kickstart template that you created earlier – this can be done by setting associations correctly. Do NOT set a Puppetmaster for the hostgroup, unless you intend to use Puppet in addition to Ansible. And that’s it – when you deploy a host from this hostgroup, the one-shot Ansible callback service will be configured to run after reboot, will execute and configure the server into its designated role.